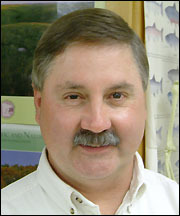 Steve Aagesen, biology teacher at PAHS, is retiring after 28 years in Payensville. History teacher Jerry Meyer is also retiring after 30 years at PAHS. Steve Aagesen comes from a family of teachers. His dad was a principal, all of his brothers are teachers, all of his sisters and their husbands are teachers, and he and his own wife are both teachers. But originally, his love for the outdoors attracted him to the thought of a career in environmental conservation. "I still think that's great work, but I thought I could do more for conservation by dealing with thousands of people than I could by counting duck nests," said Aagesen. "I figured: what good does it do if the rest of the world doesn't know about it? So I switched over to the people aspect to get out as much information as I could." Aagesen came to Paynesville in 1975, after teaching for two years in Fairfax. He has since spent 23 years teaching middle school and five years teaching high school. He wanted to live more in the lake country of Minnesota and liked the idea of being able to fish a mile away from his house. Aagesen's favorite part about his job is helping students make connections between academic knowledge and real life. "I like to relate science in a book to something that's really going on," said Aagesen. He says science allows him to give information that is actually helpful on topics that have captured the attention of the media, such as the human genome, terrorism and anthrax, and smallpox. A topic such as genetically-modified crops is especially relevant to many students in this area, added Aagesen. Aagesen believes the role of a teacher is to provide information that is useful for a person as they go about developing a career and living their life, and he finds biology is a subject that easily fits those criteria. "Not everybody's into biology, but whether you're a scientist or not, health is something everybody can control," said Aagesen. "Our homes and the cars we buy all have a big impact on how healthy this world is going to be to live in." Aagesen points out that pollution, smoking, and diets also have a big impact on a person's life, and that studying biology is one way to learn about those things. As is the case with most teachers, Aagesen says the least favorite part of his job is having to discipline students. But he is quick to add that students are students, and kids weren't perfect in the 1950s and 1960s either. However, one change he has seen among students is that both academics and sports seem to get pushed into second place in favor of working, because students want to have money for a car and insurance. "It's kind of a trap. People spend their young life working when there's plenty of time for that later," observed Aagesen. "The big message is that all the money in the world is no good unless we have a decent world to live in, with water we can drink, air we can breathe freely, and lakes we can recreate on. But it's hard for people to pass up a quick buck, even at the expense of the environment." Aagesen says the most notable differences between middle school and high school students are that middle school students are more enthusiastic and easier to get excited but are less mature. High school students, on the other hand, are well on their way to becoming adults and can hold an intelligent conversation. However, he says they also seem to be more tired and are harder to motivate. If he could give one message to students, it would be: "Teachers are trying to help you, not rain on your parade. Everything isn't always thrilling, but we're trying to give you the background on reading, math, and science so you can use it either immediately in your life or in further education." Aagesen says he will miss being around the students. "I believe teaching keeps you young. You keep up with what's going on in young society, and you know what the talk of the students actually means," said Aagesen. He says it will also be hard to leave his fellow teachers behind, having worked with some of them for 28 years and experiencing each other's ups and downs. But he says he will likely return to substitute teach or will find some part-time work. In his retirement, Aagesen plans to travel, garden, and hunt and fish as much as possible. "I want to do all the hunting and fishing I can while I'm still physically able to do it," said Aagesen. "I sometimes think I was born in the wrong century, because I'd be happy in a cabin with a fishing rod and a gun by the door." Jerry Meyer has taught in the same classroom in Paynesville since the new school opened 34 years ago. He had originally planned to stay in Paynesville for only a couple years but said he was hooked by the smalltown community, the area lakes, and the welcoming teaching staff. "I don't think I could have got a better job anywhere else," said Meyer. "Most of the kids who leave here and want to be successful are, and I think that's a tribute to the community and the school," added Meyer. Meyer says he enjoys his job both because he likes history and because he likes working with kids. "They're always doing something different and fun, and sometimes they drive you crazy, but it's fun to see them grow up when they have jobs." Although he enjoys watching his students grow, Meyer says one part of his job that he could do without is the endless paperwork. "It's tedious meeting the state's ever-changing requirements, and then after all the investment we put in the Profiles it's all wasted, basically. Even the parts that were good are going," noted Meyer. Equally frustrating to Meyer is having to discipline students, though he says most students are just fine. The biggest change Meyer has seen in students is that they are exposed to a lot more information than they used to be. "Young people are aware of so many more things that are going on, but that doesn't necessarily make them better students. The clear focus education used to have as 'the way to get ahead' has disappeared, or at least become more obscure. I don't think the value of education is viewed by students the same as it used to be." Meyer sees education as a way for students to utilize their fullest potential. He draws an analogy between a computer and the software that runs it. "The computer won't do anything unless it's got all that programming in there. You've got to have the tools or you can't run the programs," he said. In his time here, Meyer spent many years on the city's planning commission and has also been an active member on his church board. He has volunteered for charity fund drives and was also involved in Boy Scouts when his boys were young. Meyer thinks the things he will miss the most about his job are the everyday interactions with people, like talking in the hallway in the morning or having coffee. He says he already misses seeing those who have retired before him in such settings. "Once I'm retired I won't see people like that again," recognized Meyer. For any aspiring teachers, Meyer has a few words of wisdom: "Get ready to learn a lot. Get ready for anything you can imagine to happen, because it will. Try and have a sense of humor about most things. Try to think of your students as your own kids and what you'd like to have for them. Be open to change and accepting of other people's ideas. Roll with the punches, and you'll do fine." He also advises being honest with students, because then for the most part they will be the same way back to you. Meyer isn't exactly sure what he'll do in his retirement yet. "When fall comes and I don't have to go back to work, then I'll see what I want to do," he said. For the time being, he plans to do some traveling, meet some new people, and continue working at H&L Express. 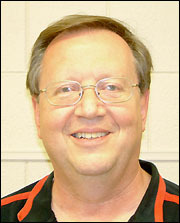 Meyer is retiring after teaching for 38 years, including 34 years in Paynesville.